West Indies 182 and 3-43 (Darren Bravo 11, Kieran Powell 9, Ravichandran Ashwin 2-12) trail India 495 (Cheteshwar Pujara 113, Rohit Sharma 111*, Sachin Tendulkar 74, Shane Shillingford 5-179) by 270 runs. West Indies managed 182 runs in their first innings followed by 3-43 in the second whereas India amassed 495 in the first one. 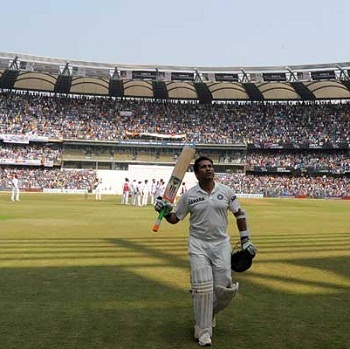 The second day of the 2nd Test came to an end on Friday, November 15, 2013, at Wankhede Stadium, Mumbai. Earlier, the hosts started the day at 2-157 in 34 overs whereas Sachin Tendulkar and Pujara were at the crease at 38 and 34. The first got off with a couple of fours and attained his 68th Test fifty with another boundary. Pujara reached his half century in the 45th over and the partnership was enhanced to 221 when Sachin Tendulkar was gone for 74 off 118 balls with 12 fours. 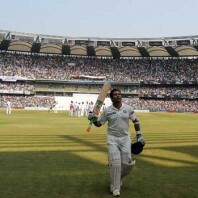 He got tremendous applauds on his way back to the pavilion after playing, most probably, his last international innings. Virat Kohli joined in next with Pujara and the run rate was picked up instantly by the two batsmen. Kohli achieved his seventh Test fifty on 53 deliveries and went back to the pavilion four runs later. Rohit Sharma walked in next while Cheteshwar Pujara blasted his fifth Test hundred in the process. 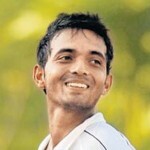 The latter fell at 354 after contributing 113 and the home side lost few quick wickets. They ninth wicket went down at 415 when Mohammed Shami associated with Sharma who took over the game and went past his fifty. The game was completely dominated by Sharma who speeded up the scoring rat and smashed his second Test century with a smart six. He remained unbeaten for 111 off 127 with 3 lofty sixes and 11 fours as India hammered 495 in 108 overs. Shane Shillingford was the highest wicket taker with five, Narsingh Deonarine held two whereas Shannon Gabriel and Tino Best shared one wicket each. The Caribbeans conceived a first innings lead of 313 runs and lost three wickets in the first 12.2 overs. Kieran Powell, Tino Best and Darren Bravo went back to the dressing room for 9, 9 and 11 runs whereas Chris Gayle was batting at 6 when play was called off for the day. 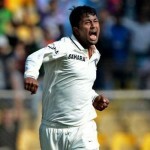 Ravichandran Ashwin grabbed two wickets and Pragyan Ojha chipped in with one. West Indies still require another 270 runs to save an innings defeat which looks quite eminent and the game may conclude on the third day.